It’s time for another look back into one of my oldest, and yet, most popular posts. Originally published 10/13 (that’s nearly 5 years ago!!) 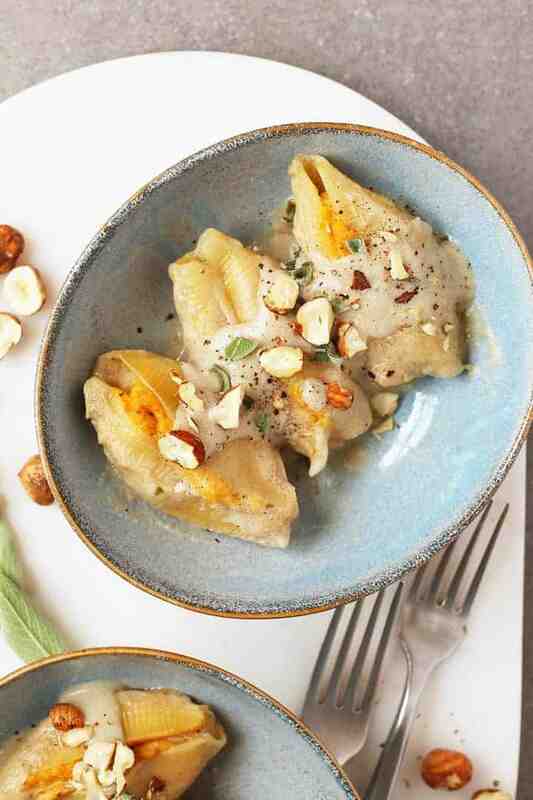 these Vegan Stuffed Shells with Pumpkin and Cashew Ricotta have been in dire need of a little makeover. But before we get to the recipe, let’s talk about how it’s almost October! October is my absolute favorite month of the year. What’s not to love? Halloween. Rocky Horror Picture Show. Beautiful chilly mornings with Spicy Chai Lattes. Cozy evenings near a fire. Sweaters and scarves. Corn mazes and hay rides. Apple Cider Donuts. What am I forgetting? Oh yes, pumpkin. I warned those of you who subscribe to my newsletter that, because of some magical, mysterious, miracle, I have an entire pumpkin patch growing in my backyard. And what does that mean? A whole lotta pumpkin recipes coming your way. So let’s commence with the first one of the season. Let’s talk about how to make these vegan stuffed shells. These pasta shells get cooked like most other pasta but for this recipe, you will want to make sure not to cook your shells past al dente – that means it’s slightly firm. If they are too soft, they will tear when filled. But don’t worry. Since they bake 40 minutes in creamy Béchamel sauce, they will get plenty soft when all is said and done. 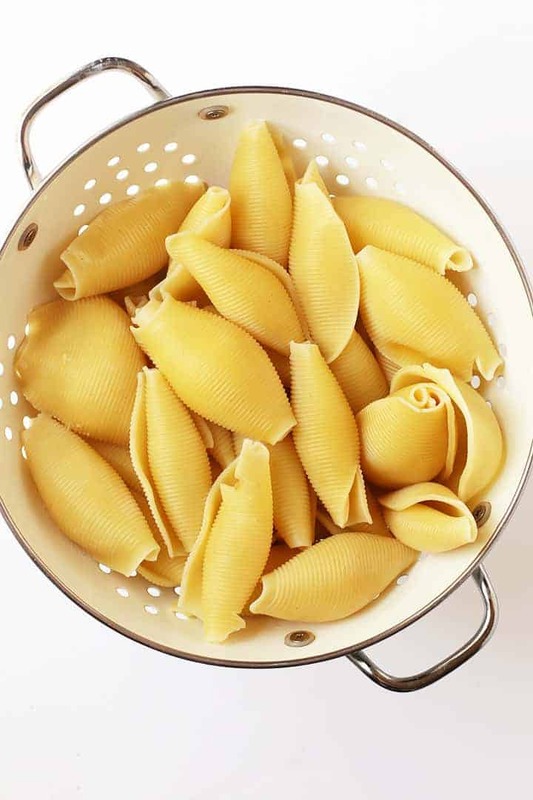 Once your pasta shells are done, set them aside to cool enough so that you can handle (stuff) them. The cashew ricotta is a quick, 5-minute recipe that involves blending cashews with nutritional yeast, lemon juice, and a few spices. While I typically recommend using a Vitamix for blended cashew recipes, in this case, since you’re looking for the consistency of ricotta cheese, a food processor works great! 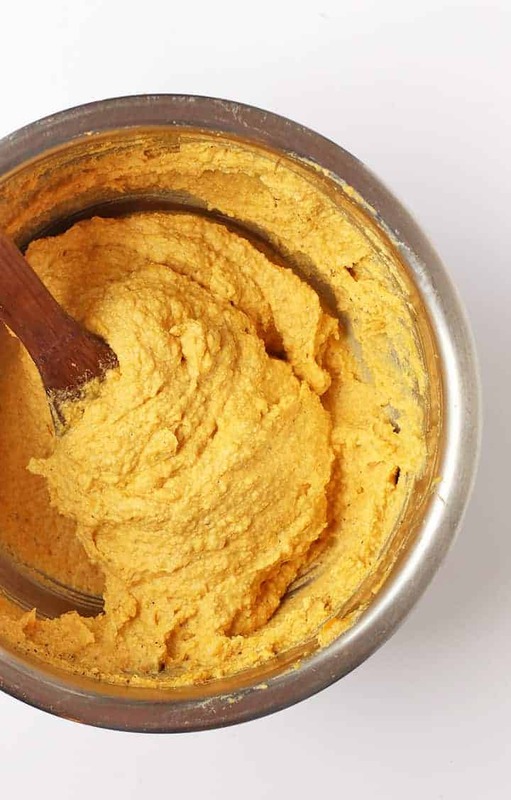 Once the cashew ricotta is made, it gets mixed with pumpkin purée and a few spices for a creamy, rich, sweet, savory filling that is oh so good! As far as this recipe goes, your Béchamel Sauce is the only component that takes a bit of work. Béchamel is a basic roux made from frying flour in butter to create a thick, creamy sauce. Vegan Béchamel is surprisingly simple. With vegan butter (I use Miyoko’s) and unsweetened non-dairy milk, you can make a creamy and delicious sauce as good as the original. To stuff the shells, take a single shell and gently press it open from the top and the bottom with your finger, opening it up width-wise (rather than lengthwise). 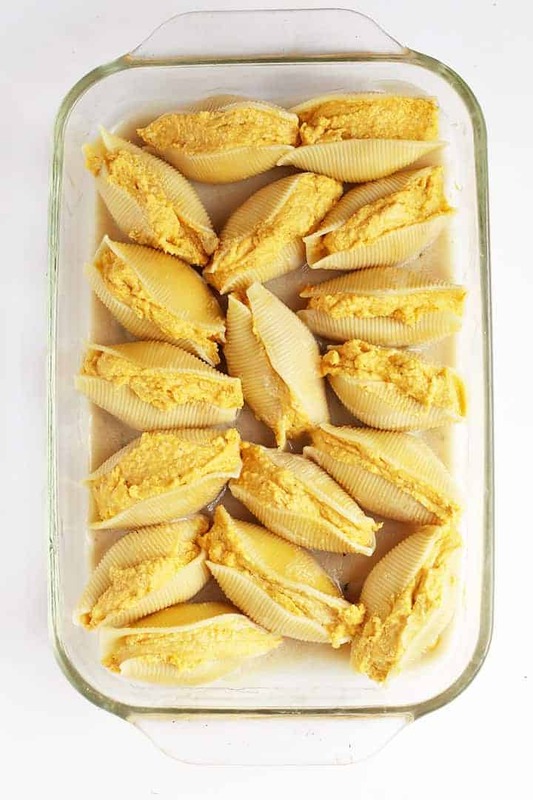 Scoop 2 heaping tablespoons of pumpkin ricotta inside each shell and place them in your prepared pan. Repeat until all shells are gone. You will likely have a few torn shells, so I always make about 4-5 extra shells for this recipe. That’s it! Cover with Béchamel Sauce, thrown in the oven, and bake. Forty minutes later and you have a delicious, warm, seasonal, pasta dish that will impress all your family and friends. It’s a fall staple in my house and, if you make it, you will see why! Serve these pumpkin stuffed shells immediately. I like to add some extra bechamel sauce, toasted hazelnuts, and fresh sage. Tightly wrap any leftover shells and store them in the refrigerator for up to 3 days of the freezer for 1 month. Can these pumpkin shells be made in advance? Yes! Make the shells according to the instructions below. If you are going to be storing the shells, wrap them in plastic wrap before baking them and place in the refrigerator or freezer. To bake frozen shells, let them thaw in the refrigerator overnight before baking them. They will need a little longer in the oven since they will be chilled. I think that’s all you need to know about making the perfect vegan stuffed shells. Let’s take a look at the recipe card below! 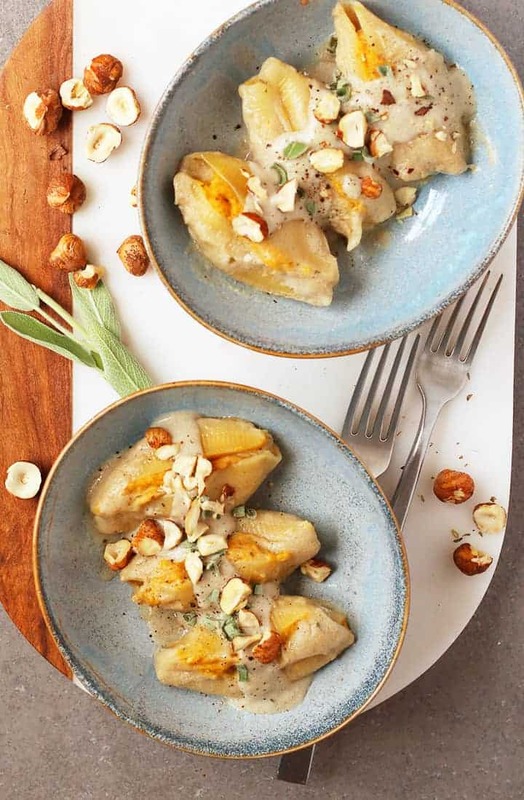 These Pumpkin and Cashew Ricotta Vegan Stuffed Shells are topped with Sage Béchamel Sauce for a delicious plant-based pasta dish the whole family will love. Prepare the jumbo shells according to packaged directions. Strain through water when shells are al dente. Do not overcook as they will become too tender to stuff. Allow shells to cool while preparing the filling. In a food processor blend together the ingredients for the Cashew Ricotta until it begins to resemble ricotta cheese. Transfer to a large bowl. Add pumpkin puree, garlic, dried herbs, salt and pepper and mix to combine. Set aside. To make Béchamel Sauce, heat vegan butter in a medium saucepan over medium-high heat. Once butter is melted, add flour and stir for 3-4 minutes, until mixture is golden-brown and fragrant. In another pot, bring milk and minced garlic, sage, and nutmeg to a boil. Add hot milk to butter/flour mixture in 3 batches. Bring to a boil, whisking often, then reduce heat to a simmer. Cook for 10 minutes, whisking constantly. Once thick and creamy, remove from heat and set aside. The sauce will continue to thicken as it cools. Pour half of the Béchamel Sauce into a 9x13 baking pan. To stuff shells, gently press the top and the bottom with your fingers so that shells open width-wise. Spoon in 2 heaping tablespoons of pumpkin/ricotta filling and place in the pan on top of the Béchamel Sauce. Repeat until all the filling is gone. Top with remaining Béchamel Sauce. Cover with tin foil and bake for 30 minutes. Remove foil and bake an additional 10 minutes until sauce is hot and bubbly. Remove from oven and allow shells to cool slightly before serving. Serve with fresh sage, hazelnuts, and freshly ground pepper. Transfer any leftovers into an airtight container and store in the refrigerator for up to 5 days. Seriously incredible. Brought this to Thanksgiving for my non-vegan family and everyone was so impressed. I had a pumpkin ravioli years ago that I’ve always craved, and this was everything I’ve been wanting and more! I will be making this again and again I’m sure of it. Thank you! I made these yesterday for my husband. They were really good! I used oatmilk instead of soy milk. I am not sure what difference this made. I found the sauce so rich and even a bit sweet! I am really impressed (with the recipe and myself )!! Thank you! could you add something to add a liitle spice/kick? Or do you think that would throw this off? What would you suggest? Thank you, I can’t wait to try this for my vegan husband! I would suggest adding a little red pepper flakes. Let us know how it goes! Hello, I am excited to try these out! I noticed you had the nutritional information (thank you so much for adding it!!) and I was wondering how many shells are considered a serving according to the nutrition facts. Thank you so much, I cant wait to try this!! That nutritional information is calculated assuming a serving size is 3 shells. I can’t have sage because of a medical condition. Any idea of something I could substitute instead? Hi, aprox. how many cups does the cashew ricotta make? Dana, did you use active yeast instead of nutritional yeast? You used bakers yeast, nutritional yeast is very different, you can get it in bulk food stores, health stores. It yellow, large flakes that have a buttery cheese taste! i am planning on making these for thanksgiving and want to make them ahead of time. any tips on what step to stop at/how to store them until then? thanks! I made tofu and spinach stuffed shells this week that didn’t turn out well and was very discouraged – your comment about having the space experience was refreshing and reassuring, I look forward to trying this recipe! Oh I hope this one turns out much better for you! I couldn’t believe the difference it made when I used cashews. You are amazing! I make your meals all the time and they turn out perfectly! I say, you can cook it and teach it! I wanted to make this meal for my daughter’s 2nd birthday, which is winter solstice Saturday. However, I was looking for GF Jumbo pasta shells and, here in Portland, NO one carries them (I called 7 grocery stores)!!! I wanted to ask you if you thought I could improvise with GF lasagna noodles and cut them and roll them with the stuffed pumpkin filling?? Any suggestions or variations on noodles for a desperate mother trying to please her little girl?! Thanks Brooke! You could totally use lasagna noodles and make rolls with the filling. If you are curious about the technique just google “lasagna rolls” and you will see what I’m talking about. Good luck. The most delicious thing I’ve ever tasted!! Thank you for sharing! These were incredible! My boyfriend and I both loved them (and he’s not vegan :)) Thanks so much for the recipe. So happy to have found you! This recipe sounds/looks scrumptious ~ will try it very soon. And so happy there is NO tofu!! 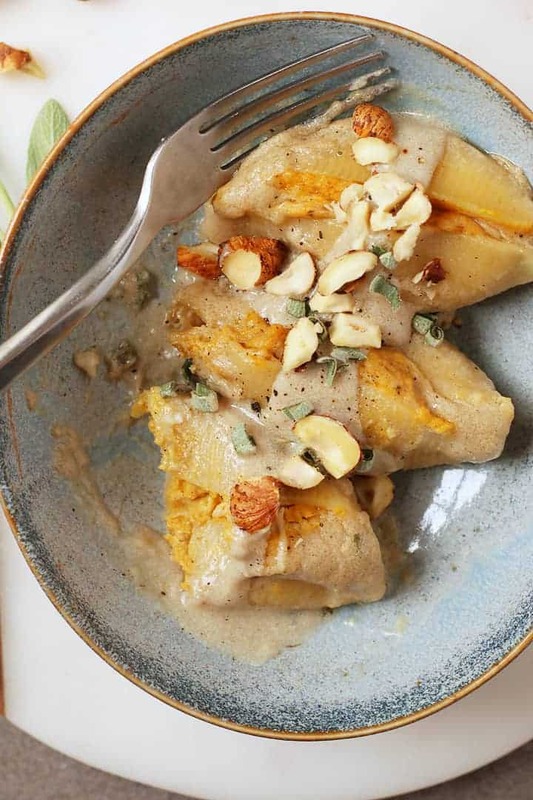 What a great idea to mix pumpkin with cashew ricotta–I bet it tastes as amazing as it looks! I also love October and pumpkin and am looking forward to seeing what else you’ve got in store this month. Oh good! I’m glad you are excited about pumpkin too! Mmmm, I love mixing pumpkin with cashew cheese. Such creamy goodness. I like the idea of having stuffed shells with the creamy white sauce as opposed to marinara.